Hey, Everything Summer Camp Fans! As a few faithful readers may recall, a little over a year ago, Everything Summer Camp posted its first Employee Spotlight post about our Lead Buyer, Kristy. As Lead Buyer, Kristy goes to tradeshows and finds other ways to stay hip to the current trends. Once we have our new products in stock, she puts them on the Web site so you can browse around and shop online. 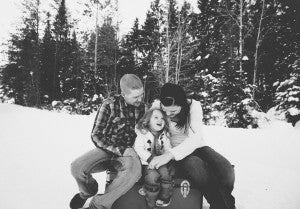 She lives in Thorp with her better half, Ryan and her adorable daughter, Kaelyn. They found Thorp was a great middle ground between their two hometowns and offered great schools and a great community. “It’s a very small town, but we love it!” Kristy says. Their daughter, Kaelyn Mae just turned three which brings a wave of both excitement and sadness for Kristy. “They grow up WAY too fast,” she comments. But for now, Kaelyn remains a very funny, smart, and spunky little girl. “She’s what makes our world go round,” says Kristy. And Lucky is the six-year-old, chow and yellow lab mix around which Kaelyn’s world revolves. Always fascinated by the family dog, Kaelyn loves having her around. “She’s absolutely sweet as pie and Kaelyn’s best bud.” Kristy smiles. “Family is the most important thing in my life and I’m very blessed to have so many people in mine,” says Kristy. Aside from her small family with Ryan, Kristy is the youngest of four. She’s got two nieces and two nephews. She’s got quite a lot of family on her dad’s side and everyone is very close. They all go on an annual camping trip to see each other and catch up. The annual camping trip has been a tradition since before Kristy’s time even! Her favorite part about the camp trips is watching Kaelyn who’s experiencing so many things for the first time. It reminds Kristy of what the world was like back then! “I love watching her grandparents teach her the same things that their parents taught me,” Kristy says. She loves the outdoors so they do lots of fishing. And, of course, Kaelyn always catches the most. Come back again to hear more about us at Everything Summer Camp.